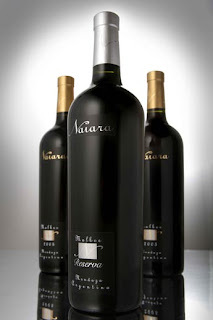 The 2006 Naiara Malbec Reserve, great juice at a great price! Hey wine fans if you love a great Malbec at an amazing price you’re going to enjoy this review and when you see the price point you’ll be even happier. The wine for this review is the 2006 Naiara Reserve Malbec from Argentina and distributed by ARGCA IMPORTS - NAIARA WINES. Pablo Lastorta, President/Owner enjoyed a previous review of a different label from Argentina so much he asked me to review the 2006 Naiara Reserve Malbec. Naiara wines offers two approaches to the traditional varietal of Malbec. The Malbec Traditional (Gold Cap) and the Malbec Reserva (Silver Cap) demonstrate the true ability of producing quality wines from Argentina. While we evaluated both wines, collectively as a group the Silver Cap took top honors. I think the 2007 may have needed a little more bottle aging before it will be ready for review again. That said, so I and @EveSiminskie and @RobertaMurphy(their Twitter handle) enjoyed evaluating this wonderful wine while dining at Barolo in La Jolla, who has a standard $18 corkage fee (which I think is outrageous) but after some conversation with the owner he reduced the fee to just $4 per bottle as we brought the 2007 Shenandoah Valley Rezerve Zinfandel and another Malbec for review. Mean while back at the restaurant which was experiencing AC failure that (which was a very humid) evening, while me and the other reviewers suffered through the swelter during dinner as the owner had no other contingency plan, we later moved to the patio for some relief after dinner. Let’s just say we were all less than pleased with our collective dining experience. I really wanted to write and get this review posted last week, but between work and getting ready for the 2nd annual Wine Blogger Conference and having no Internet connection while we were at the Flamingo this review is at the top of my to-do list for today. So now it's Tuesday morning and it's is time to get some reviews completed. Yep reviews plural because I have a stack of reviews to write, after a tsunami of wine washed over our palate this past week. First Swirl: A medium to dark ruby red core, surrounded by a cerise colored rim and medium body and viscosity. First Sniff: Putting my Irish American nose deep in the glass, aromas of dark cherry, vanilla and sumptuous spice box envelope my senses, which was coaxed out after an hour of decanting. First Sip: Generous flavors of raspberries and blueberry match this wine’s sweet spice, which co-mingle nicely upon the palate. French oak ageing brings hints of vanilla and smoke as the wine develops with excellent balance and persistence. The tannins are soft and round, with delicate roasted notes of coffee and its supple richness continues on the lithe chocolate finish. Pricing and Alcohol percentage: This wine weighed in at a meager 13.4%, which means they extracted a lot of fruit character without having to make what some would call a "cocktail" wine all the while keeping this wine at an extremely value oriented price point. This wine is sold in San Diego Costco stores for $8.99 each. Vineyards and aging: The wine matured in 9 months in French barrels and the fruit was sourced from 60 to 70 year old vines located in Medrano and Pedriel in Mendoza, Argentina. Imagine if this wine was allowed to age 12 months how much better it would have been. Other Voices: Rated by Parker & Wine & Spirits Magazine as Argentina's Best Buy for Malbec and the other reviewers with me were so impressed they all sought this wine out and grabbed a few for themselves! My Recommendation: This wine is what I would call an everyday drinker, worthy of a case purchase. This wine will compliment many types of food, as we ordered pizza and other Italian dishes which paired nicely, this wine is smart and sophisticated for a small price point!